Play for real money at iNetBet and you are eligible to receive all our current offers, which are regularly updated below. ??? Mystery Bonus Coupon ??? In addition to the offers available in our newsletter we will be giving out extra coupons. Click on the link below to see what we have for you ??? Click on the image below to see what we have for you ??? We have hidden special birthday chips on the website that contain great birthday bonuses. Can you find them all? 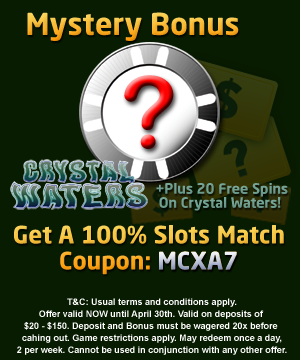 75% Real Series Slot Match*"
These can be found only in your casino cashier. Simply open up the "Coupon" sub-menu. Here you will find a host of great slot offers including a reload bonus and also some theme related bonus offers. As a new player you are eligible to claim any of our Great Sign Up Offers. Must make a deposit in order to withdraw. Be sure to check here on a regular basis. In addition to the offers above we will also be giving out extra coupons. These are based on various holidays be they monthly or daily. Check here regularly. Deposit via most methods and if you lose you can receive a 10% rebate bonus on your first 5 deposits made, until the end of the month. Deposits must be made through the iNetBet Website. Maximum Deposit Bonus on a single deposit is $50. Minimum deposit is $10. To claim your bonus simply Click Here and request the bonus. Please remember to give your account ID when doing so. Bonus can only be claimed once deposit has been played through at least 10 times. Bonus monies can only be cashed out after your deposit has been wagered a further 5 times. Bonus cannot be used in conjunction with other bonus offers or coupons. Leave the bank and start playing*. Players must adhere to all of our rules and regulations. Offers start at 12:00am and expire 11:59pm, Valid until date shown above. One bonus per player / household (location) and computer. Match bonuses will be added to a players account on redemption. To receive non match bonuses players must wager their deposit a given number of times as shown above. All bonuses must be wagered 15x before cash out can be made, unless otherwise stated. All deposit AND wagering must take place within the allotted time of promotion. Minimum deposits and Maximum Bonuses apply as above. Offers do not apply to Craps, Roulette, Sic Bo, All Caribbean Games, Multi-Hand Video Poker, Video Poker, Tri-Card Poker, Texas Hold'Em, War, Blackjack/21 variants or Baccarat play. Unless otherwise stated all System wide progressives are blocked from bonus play. Please note players are unable to use any bonus monies in Multiplayer games prior to all wagering requirements being met. With game specific bonuses, monies can only be used on given game. Any play / winnings gained on excluded games with monies including a bonus or part thereof will result in all winnings being void. Full wagering requirements must be met prior to cash out. During bonus play players bet may not be or exceed 25% of deposited funds - If this is the case play will be void. With all winnings due, players may be asked to provide proof of legal age. iNetBet reserves the right to withdraw bonus credit in cases of bonus abuse. Some accounts may not be eligible for bonus coupons due to previous bonus abuse. Match Bonus: The majority of our bonuses are of this type. This type of bonus is fully cashable once full wagering have been met as per the terms of the bonus. Sticky Bonus: From time to time these bonuses are offered. This is a Play Bonus - the bonus credits are for wagering purpose only, and only winnings from the bonus and not the bonus itself may be cashed out. Only allowed games can be played even after wagering is met. At the time of a cashout the amount of the bonus will be deducted from the balance. 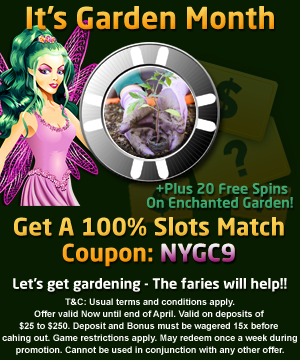 *" Real series slots coupon: Only applies to real series range of slots. "*Classic Slots: Only applies to Classic slots. Real Series range of slots cannot be played. ** High Roller Bonus: bonus only available to players who have turned over a given amount in the past 3 months. Accounts that are eligible have been pre-determined. Those accounts not assigned "High Roller" status will be unable to claim this bonus. *** Bingo & Keno Bonus: Only applies to Keno, Bingo & Scratch Card play. ****Video Poker Bonus: Can play all standard allowed games along with Single Hand Video Poker. MultiHand Video Poker is excluded. *"*"New Player Bonus: This bonus is only available to players who have never played at iNetBet in the past. Deposit and Bonus must be wagered 15x before cashing out. Full wagering requirements must be met prior to cash out. Players will need to make a verification deposit on withdrawal. #Caribbean "7" coupon: Only play on the following games is permitted. 7 Card Stud, Caribbean Hold'Em, Caribbean Stud Poker, Caribbean Draw. ~Table Poker coupon: Only play on the following games is permitted. 7 Card Stud, Caribbean Hold'Em, Caribbean Stud, Let Em Ride, Pai Gow, Tri-Card Poker. (+) Return Bonus: This bonus is only available to players who have not played for Real Money at iNetBet in the past 30 days. Deposit and Bonus must be wagered 15x before cashing out. Game restrictions apply. Full wagering requirements must be met prior to cash out. If coupon is applied to larger deposits coupon will become void. (+) $5 Return Free Chip: This bonus is only available to players who have deposited in the past year (365 days) but not played for Real Money at iNetBet in the past 30 days. Bonus must be wagered total of $400 before cashing out. Game restrictions apply. Full wagering requirements must be met prior to cash out. Max cash out is $50. A fresh deposit of $20 or more will need to be made in order to be eligible for cash out. Any deposit made will need to be wagered at least once. This chip is separate from other free money rules. ^Free monies can only be claimed by players who have deposited and played for real money at iNetBet in the past 2 months. Should the coupon be claimed without this being the case no cashout will be permitted. Players cannot cashout if their last withdrawal was from a free chip and no subsequent deposits have been made. Freerolls qualify as free monies - terms apply. Players can only claim a max number of free chips between deposits, only two allowed. Once wagering is met any excess winnings will be removed and max withdrawable amount will be added to your real cash balance. Standard non deposit rules and regulations apply.